Archaeologic They would, Clive Sinclair claimed on 23 April 1982, revolutionise home computer storage. Significantly cheaper than the established 5.25-inch and emerging 3.5-inch floppy drives of the time - though not as capacious or as fast to serve up files - ‘Uncle’ Clive’s new toy would “change the face of personal computing”, Sinclair Research’s advertising puffed. Yet this “remarkable breakthrough at a remarkable price” would take more than 18 months more to come to market. In the meantime, it would become a byword for delays and disappointment - and this in an era when almost every promised product arrived late. 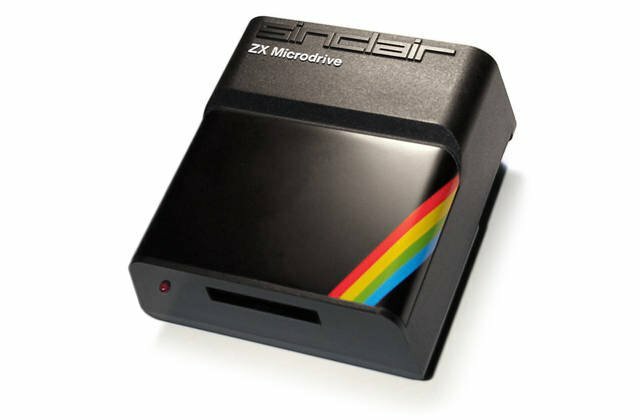 Sinclair’s revolutionary product was the ZX Microdrive. This is its story. At the launch of the Spectrum, held on the first day of the Earl’s Court Computer Fair, Sinclair presented a prototype Microdrive to assembled journalists and provided a brief overview of the device’s promised capabilities. Many of the gathered hacks were impressed. That was indeed a “remarkable price”. Commodore’s single-disk 5.25-inch drive for the Vic-20, launched around the same time, was priced at just under £400 - eight times the price of the Sinclair offering. Even Sony’s aggressive launch price for the 3.5-inch drive it brought to the UK in November 1982 was still, at £235, much higher than that of the Microdrive. Sure, the Vic-1540’s disk capacity was greater - 174KB per disk rather than the 85KB the Microdrive would eventually offer, and the Sony diskette could hold even more - 218KB - but who cared when the up-front cost of the Sinclair drive was so much less? There was no question, though, that the Microdrive wouldn’t take some months to come to market. At the launch of the Spectrum, Sinclair admitted the Microdrive wouldn’t go on sale until later in the year. 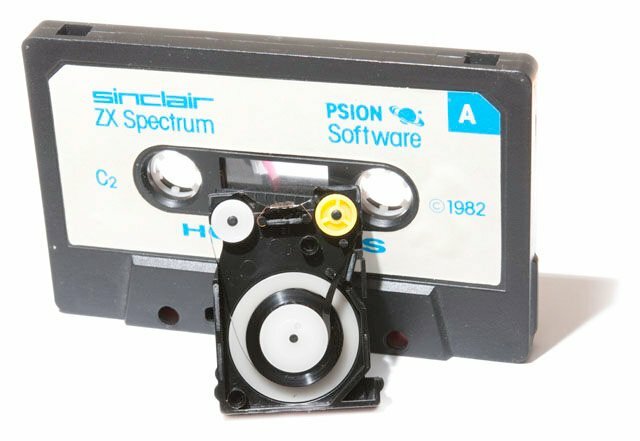 Over the coming months, the trials and tribulations of getting the Spectrum into production and shipped out to buyers - the company wouldn’t even begin to get over the order backlog until well into the autumn of 1982 - before the focus of complaints about broken Sinclair promises would shift to the Microdrive. “Our Microdrive, when it comes out, will revolutionise mass storage thinking,” said Sinclair engineer Martin Brennan in the 18 November 1982 issue of Popular Computing Weekly after being asked about the new Sony drive. His take: yes, 3.5-inch unit was faster, but it’s the price that really matters. Of course, what Brennan couldn’t then answer was the question posed by his own comment: when would the Microdrive actually come out for people to buy? As 1982 came to an end, the section within Sinclair’s Spectrum advertising describing the Microdrive began to change. Ads from 1982 had described the product as a “a single interchangeable microfloppy”. But by the end of the year, that text was changed to read “a single interchangeable storage medium”. The release window went from “later this year ” to “the early part of 1983”. By the Spring of that year there was still no sign of the promised product. At least Sinclair wasn’t yet taking orders. The continuing no-show prompted Sinclair Research computer division chief Nigel Searle to issue an update: “The design has been finalised and we are now waiting for custom-made semiconductor chips - being manufactured in the UK - to arrive,” he told the press. By now it was being rumoured that the Microdrive was not based on rotating disk technology, as the early advertising’s reference to a “microfloppy” had implied. Indeed, most attendees left the Spectrum launch assuming from what they’d heard that the Microdrive used some kind of diskette. Instead, it would use a “high speed tape loop”, as Your Computer put it at the time. In fact, hints that the Microdrive was not a disk system had begun to slip out much earlier, toward the end of 1982. Martin Brennan’s aforementioned comments on the introduction of the Sony 3.5-inch disk noted that “a floppy disk based system will be much faster than the Sinclair Microdrive” - a sure sign that the Sinclair offering did not, after all, use diskettes.